Lake Snowden is a 675-acre education and recreation park, featuring the largest of four lakes which form the Margaret Creek Conservancy District. 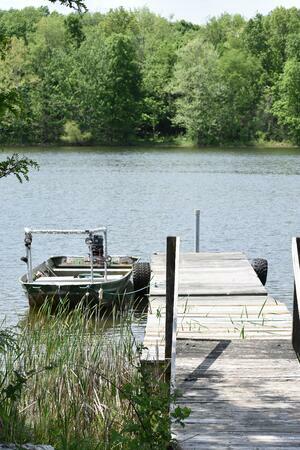 The lake covers approximately 136-acres offering camping, boating, fishing, picnicking and swimming. The serene setting reveals natural beauty while maintaining the convenience of being just 5 miles from Athens, Ohio. The shelter houses, restroom facilities, beach, shoreline fishing holes, and fish hatchery make Lake Snowden a full-featured recreation park. Lake Snowden was built for the Margaret Creek Conservancy District in 1968 with federal funds through the Farmer’s Home Administration and the Soil Conservation Service in an effort to control flooding. It opened to the public in 1972 and in 1998, Hocking College purchased Lake Snowden from Le-Ax Water District. Many of Lake Snowden visitors want an extended stay at the lake. Camping is available on a daily, weekly, monthly, and seasonal basis. We have 125 sites, 95 with electricity and 30 without for primitive camping. Campsites are divided into four areas. The Locust Grove is ideal for those wanting to use the horse trails. Big Oak camp has some lakefront sites and is close to the play area. Hickory Camp is close to the camp shelter house and off the beaten path. Hilltop Camp offers sites on the hilltop with hot showers and flush toilets (vault toilets are located in the other camps). Running water is placed throughout the park. A dump station is located near the Shower House. While campsites are rented on a first come, first served basis, reservations are accepted with advance payment. At Lake Snowden, we set aside about half of our sites for seasonal use, while the remainders serves our overnight guests. Lake Snowden features 12.5 miles of trails designated for horses and a 25-site horse camping area in our Locust Campground, which is located at the trail head. The sites will handle RVs and horse trailers, with electric on-site and water available in the campground. Tie-ups are also available in the area. Day use parking for horse trailers and vehicles is adjacent to the campground at the trail head. For overnight camping/day use, regular camping/day use rates apply, plus $3.00 per horse per day. Horse trails closed December 1 – March 1. Reserve your spot at the Lake Snowden today! There are plenty of bluegill for the younger fisherman. Other plentiful panfish found in Lake Snowden include crappie and yellow perch. The largemouth bass fishing has improved dramatically in the last few years, thanks largely to the work done by the Ohio Department of Natural Resources (ODNR). Bass measuring 12-15 inches must be immediately returned to the lake. In an effort to keep the fish population in balance, we encourage fishermen to keep bass measuring less than 12 inches. For the easy going fisherman, Lake Snowden is one of the finest catfish lakes in southern Ohio. For the macho fisherman (or woman), Lake Snowden still holds some tackle-busting northern pike. In addition, a few delicious but crafty walleye may still lurk in the lake. Fishing at Lake Snowden is free and open to the public but the Ohio Division of Wildlife does require persons age 16 or older to have a valid Ohio fishing license. Boaters are welcome to enjoy the scenery and wildlife at Lake Snowden. In an effort to protect the natural beauty, control shoreline erosion and maintain the quiet, serene setting enjoyed by many, Lake Snowden is a “no wake, idle only” lake. Boat rentals are available. Boaters searching for wildlife in or around the lake can expect to see whitetail deer, Canada geese, many species of duck, beaver, mink, fox, raccoon, squirrel, rabbit and wild turkey, plus an assortment of aquatic wildlife. Boating on Lake Snowden is free and open to the public but the Ohio Division of Watercraft does require that all watercraft display a valid registration. Lake Snowden operates a boat rental facility which offers canoes, rowboats, paddle boats and kayaks. 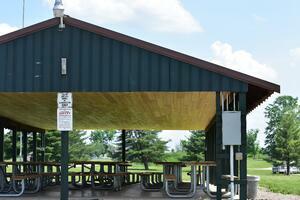 For your enjoyment, Lake Snowden offers two shelter houses with seating for 75 each. The shelter houses are available only by reservation. Electricity is available at both shelter houses. Restroom facilities are conveniently located. The adjacent fields also offer ample space for softball, volleyball, and badminton games. Dumpsters are located near the shelter houses for trash. Lake Snowden has a grass and sand beach and swimming area open Memorial Day through Labor Day, daylight hours only. No life guards are on duty and adult supervision is required for anyone 17 years of age or under. 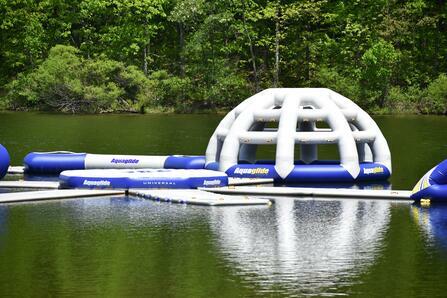 Open Memorial Day through Labor Day Weekend, the inflatable Water Park at Lake Snowden is a great way to cool off this summer. Guests are required to sign a liability wavier for Water Park Admission. Tickets start as low as $10/person. Enjoy a relaxing day on the beach or splash around at the water park. No person shall gather firewood or use a chainsaw in the park without consent of the park manager. Absolutely no cutting of trees or brush in the park. Fires are permitted only in fire rings. Bicycles must stay on the roads and obey all traffic rules and laws. ATV’s, including off-road motorcycles, three wheelers, four wheelers and other off-road motorized vehicles are not permitted. Golf carts and UTV’s that are 420cc’s or less are permitted and all operators must be 16 years of age or older. Owners must provide proof of liability insurance. Speed limit is 10 MPH throughout the park, and all vehicles, UTV’s and golf carts MUST be on roadways. Vehicle maintenance and repair is prohibited without the consent of the Park Manager. Only those vehicles being immediately used for transportation by campers are permitted in the park. The parking of excess vehicles in the park is not permitted. Parking is permitted in designated areas only, i.e. parking lots and campsite parking areas. No parking along roadways, in the grass, or under trees around the shelter houses. No permanent structures such as decks, patios etc. of any kind are permitted in the park (decks are portable only). No nails, screws, bolts, eyebolts, wire, etc. are permitted in the trees; only biodegradable twine, string or rope is permitted and must be removed by the camper at time of check out. Firearms and fireworks are prohibited. Legal hunting weapons are permitted during hunting seasons by individuals permitted by the Park Manager while engaged in such activity. Lake Snowden and State of Ohio hunting regulations apply. Law enforcement officers exempted. Disorderly conduct, drunkenness, obscene or profane language is not permitted and will not be tolerated. Seasonal campers must have unit removed by November 1 and campsite totally cleaned or an hourly clean-up and/or daily rental fee will be assessed. Swimming is permitted only at the designated beach. Flotation devices, other than U.S. Coast Guard approved personal flotation devices, are prohibited. No lifeguard is on duty. Swimming is at the individual’s own risk. Adult supervision is required for anyone 15 years of age and younger. Alcohol is not permitted in the beach area. Swimming is not permitted beyond the rope. Glass containers are not permitted in the beach area. Throwing of sand is not permitted. Approximate maximum water depth is seven feet. Beach hours are 10 a.m. to 8 p.m. Memorial Day to Labor Day. Pets are not allowed in the beach area or any park building including shelter houses. Campers are required to register prior to setting up camp. Camping is permitted in designated campsites only unless approved by the Park Manager. Campsites must be registered. If it is necessary for a park employee to come to your campsite to register you and collect camping fees, an additional $5.00 fee may be assessed. Camping permit must be displayed at the campsite on the campsite I.D. post. Renewals for non-seasonal campsites shall be done no later than 2 p.m. the previous day. Quiet hours are 10 p.m. to 7 a.m. Generators must be off by 10 p.m.
No person shall disturb the peace and quiet of others in any manner. Hoses and electric cords are the responsibility of campers and shall be put away to allow for mowing and trimming. Campers are responsible for the actions of their guests. Campsites are to be kept clean and free of litter. 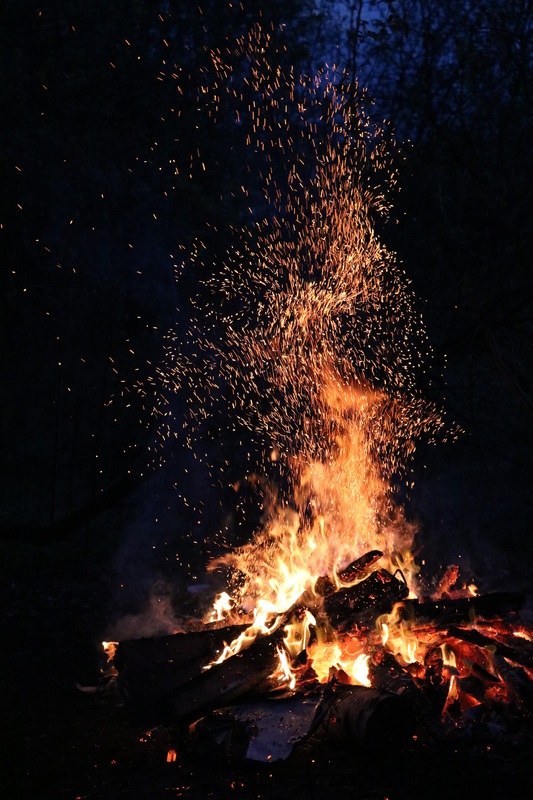 Failure to clean up one’s campsite may result in a litter citation under ORC sec. 3767.32. Firewood is to be neatly stacked. All wastewater is to be drained into approved sealed containers. Gray water may only be disposed of in the gray water receptacles throughout the campground. Sewage may only be disposed of at the sewage dump station located near the shower house. Your campsite is for your camper only. Additional units will be charged per night. Campsites shall not be occupied by more than six people. Campsite capacity: One immediate family including not more than one camper or one camper and one tent. Check in time is 3 p.m. Check out time is 2 p.m.
Campers are not permitted continuous hook-up to water hydrants. Campers must disconnect after filling their tanks. A camping permit is required to use the shower facilities. Minors cannot register or occupy a campsite without the presence of an adult. Holiday weekends will require a minimum stay of two nights. Cancellations must be made by 2 p.m. on the day of the reservation. Should you fail to cancel, you will still be responsible for all charges as they appear on the reservation. Weekly, monthly and seasonal rates are not eligible for discounts. Pets must be on a leash no more than 6’ in length and must be kept under control at all times. No person shall leave a pet unattended. Pet owner is responsible for cleaning up after his/her pet daily throughout the park. Swimming from watercraft is not permitted. All State of Ohio Division of Watercraft rules and regulations apply. State of Ohio fishing license is required to fish at Lake Snowden. All boats and boaters are welcome at Lake Snowden. However, in an attempt to minimize shoreline erosion and preserve the peaceful atmosphere at the park, all boats must run at idle speed only. Lake Snowden is a “No Wake-Idle Only Lake” pursuant to OAC 1501:47-7-14.